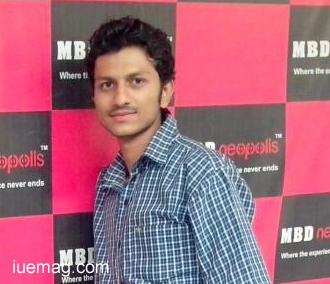 Sourabh Kaushal, a young master mind from India, is an achiever and a known face to many today. His awards talk for his intelligence and his passion towards space science. He has received 'Young Innovator Award' 2013 by Indira International Innovation Summit. line - Dr. Kalpana Chawla Young Scientist Award was awarded by Dr. Kalpana Chawla's father Shri. Banarasi Das Chawla.. He was nominated for Jerome Ledrere 2012 award by IAASS (IAASS conference organised by NASA, ESA, JAXA) at Canada 2013, invited as a Speaker at IIT Delhi Tryst 2013, INK+MIT Media Labs events 2013 at Bangalore and Coimbatore and as TEDx Speaker at Tedx IIT(Rorkee) and TEDx BITS(Goa). He has been selected as Fellow at INK talks 2012-13 in association with TED. International Achievements: Runner up Jerome Pearson Award 2010, winner by International Space Elevator Consortium, USA. He presented research paper in three International Conferences i.e. SPACE ELEVATOR CONFERENCE-2010 at Redmond, Washington, USA, EU-RO SPACEWARD-2010 at Luxembourg, Europe, ISTS-2011 at Okinawa, Japan. His research paper was selected in IEEE-ESTEL, Rome, Italy, ACM2012, Nigata, Japan, SPACE confer-ence at Isle of Man, COSPAR 2012, India. National Achievements: He has presented research papers in many National symposiums including Literati'11 at NIT, KURUKSHETRA, PRAGYAM'09, JMIT, RADAUR, INNOVA-TION'10, YIET, HARYANA. His research paper was selected in COSPAR Scientific Assembly, Mysore, India. Projects: He has worked on projects like Automation, Programmable logic controller, GLXP-TEAM INDUS etc. He has also worked on a project with Google Lunar X prize foundation - "Team Indus", the only registered team from India. Appreciation: His research paper titled "Space Debris & its Mitigation" has been appreciated by Dr. V. Adhimurthi from Indian Space Research Organisation. Success Story: His success story was published in National Maga-zine, Blogger's Park. Brief us about yourself and your Background. How did you get the opportunity of being a part of Team Indus? Team Indus is the only Team in India which is competing for the global compe-tition of VLXP Lunar Rover. In 2009-2010 when I was in second year of my engineering, I came to know about Team Indus. One day, I came to know about GLXP Prize i.e Google Lunar X Space. Then, I visited the GLXP Team. I saw the team who participated in the competition and came to know that there was only one Indian team called Team Indus. So, I visited the Team Indus website and wrote to the owner and CEO of that particular team that I was also in the field of research and space science. Even their team was doing a research in Lunar Rover Mission. I wrote to them that I was very much fascinated about the space science but my background was electronics and communica-tion engineering. I put forward my request to work in the field of space science and to do some sort of Internship or research work in Team Indus. In 2011, I did my internship with the GLXP Team Indus and I worked as a research associate with TI and after that in 2012 I completed my engineering. Then, I once again searched for some research work or job related to Space science and technology but in India there was no private sector with respect to Space science except ISRO which is a government sector. I approached TI and pro-posed that I really wanted to join TI and do something in the field of Space science and technology. As a result, right now I am working with TI as a system engineer and I am working on the power subsystem of the Lunar Rover mis-sion wherein I control the power subsystem of the Lunar Rover Lander. Initially, Rahul Narayan had taken my interview. He had asked me if I could explain my research work. I explained about my research work and after that he agreed for Internship in 2009-2010 and in 2012 before joining Team Indus I did my Internship in a Software Company in Bangalore. I did it to get an experience in the field of IT sector but my ultimate aim was to work in the field of space science and technology. How many people are working in the team and who is leading the Team? Apart from that, I am also am an INK fellow and I am also in association with the TEDx Team. I have worked with many events as well. I had spoken at the Global Tedx conference, Pune, TEDxBITS, Goa on 24th Feb this year. I was invited as a speaker at IIT Delhi and I spoke at Savita University, Chennai. I also spoke at INK + Media Lab Event, Coimbatore and Chennai. I am working with Team Indus full time. Apart from that I take 1 or 2 days leave and I attend talks at many events. I am planning to take sessions on space science in April in Bangalore. Professors from MIT, Harvard, Boston and NASA will be a part of the event. I will be presenting classes regarding satellite designing, Lunar Rover mission, Space elevator system, Virtual cockpit and how aircrafts will work? When I was in class 12, I was always interested in the concept of Human life in Space. I always wanted to become an aerospace or a space engineer. I gave the IIT examination but wasn't qualified for that examination. I got admission in one of the private universities. When I came to know about the fee structure for Aero-Space engineering which was 30-40 Lakhs, I dropped that option and went for electronics and communication. Still, I was really passionate about space science. What actually triggered you to take up space science? An incident, subject or a person, what motivated you? Was it the competition by NASA that actually triggered you to think about Human life in Space? Definitely! When I was in 1st year, I started researching more on Space sci-ence technical papers. Initially, I was discouraged by many people including the Chairman of my college, Secretary and many other people. My friends always made fun of me. They said to me, "You are an electronics engineer and now you are doing research in space science." But still at the age of 18 I wrote my very first research paper and sent it to International space elevator consortium. I was hoping for the best as it was my first ever research paper. I wasn't very good in writing research paper. However, I wrote the research paper and submitted it to ISAAC USA. After 5-6 months, when the results came out my very first research paper stood runner-up in GEROME World globally and it was the start of my research career in the field of space science and after that I wrote many other research papers for 25 International conferences. I am doing my research not for the sake of some award but for the development of society, humanity and for the development of the nation. I really want to propose new technology which will be beneficial for humanity, society and for the development of our nation. How are your parents supporting you and it would have been very difficult for you with absolutely no support from friends and people around? My parents always supported me in my studies. They always said that, "If you really want to do further studies in the field of space science in future then go for it." Was there any pressure to take up a job? I didn't have any pressure. I wanted an experience and that's why I joined a software company. I need to be technically strong. What is your exact role in project Indus? I take care of the power subsystem of Lunar Lander. This power subsystem takes care of the power supply of the entire mission from the time the vehicle is launched to until it brought back. It controls the power given to the sensors, the batteries, the motors and other parts of the Lunar Lander. What are the problems that you faced? Team Indus is different from Research. During my research work, I have faced many problems with mentorship, guidance and job. I didn't have proper men-torship as I was from a small place from Haryana and my college didn't support any such activity. I wrote to many scientists in India and they responded in 6-7 months which demotivated me to do research work but on the other hand when I proposed a new technology and mailed it to experts of NASA, they responded within 24 hrs. That is the difference between India and US. Apart from this, there were some financial issues as well. I wrote to the Government of India and various other people. I wrote to Dr. APJ Abdul Kalam sir, our honourable Prime Minister of India and then to the CM of my state but unfortunately Government of India never supported space science and technology. I have met many students who say that they have some innovative ideas, but they don't have any sort of platform. So, even they are facing the same problems that I faced during my research work. I really want to be of help and provide platform to all the students. I want to create a private space sector in India. It's a dream to start up in the field of Space Science in India. So, now I am also working on learning as to how to setup a private space startup in India. We have just started and we will be taking up workshops and events in various universities. Our first event was on 13th and 14th of April, at Jalandhar in Lovely Profession University to about 1000 students. Satellite designing workshop, automobile workshop and guest lecture by chief scientists were part of our agenda. We are planning to have examinations and hire the best students to start with the Mars mission. That will be the next big thing in India. I want to create jobs in India in the field of space science and technology. Is there a funding problem with Team Indus? May be there is. I am not sure but I think there is. Team who wins the competition gets 30 million dollars as funding from Google. 2015 we should be launching positively. Right now we are in conversation with the chairman and people in ISRO for guidance and mentorship to launch the Lunar Lander. Which was the toughest call of life? Firstly in class 12th, I failed to get in aerospace. Second I got into engineering. Whenever I went for a interview and interviewee would ask for a resume, they would ask me there is a mismatch. I was rejected and told that I need to check out with Space science companies. When I went to space science companies, they would tell me you are not an aerospace engineer. I faced a lot of problems. You should have an experience when you want to become an entrepreneur and for that sake I wanted a job to open a space science technology company. Many are really facing the problem. That is why I want to start up my company. Which was the most difficult point in life? It was to take ECE and leave Aerospace engineering though I was interested in the later. I believed that no matter which engineer you are you can enter into space science. It's a combination of all streams of engineering but you need experience. Is media exposure a necessity? Definitely! It is a necessity. I spoke in different conferences. As a result, now, the students interact with me and also write to me. It plays a major role in giving a message to the government. We are talking about the next super power, to make it happen you need to be innovative and creative, in any field that you are into. If you are innovative and creative you can create some jobs in the future which will increase the economy day by day. In this way, India should be a super power. Every youngster of India should be innovative and creative to create something new in the future. Any facts, figures or references stated here are made by the author & don't reflect the endorsement of iU at all times unless otherwise drafted by official staff at iU. This article was first published here on May 2013.